The attached picture represents the realization of our long-stated vision to manufacture a modular pinball platform and deliver a variety of games and gameplay features in the form of add-on game kits. The goal was enormous, and the challenges were real, but so were the efforts and sacrifices of our team and the support we received from early customers and pinball community members. Together, we did it! For those new to our products and vision, the three machines in the picture are the same… same cabinet, same backbox, same power supplies, same control system, same playfield frame, etc. What’s different are the upper playfield modules, the translites, the magnetic cabinet artwork (including aprons), and of course the software and lower playfield LCD content. Anybody with a P3 and a library of games can play them all on the same machine, and switching them takes only seconds. Past tense musings and self-congratulatory notes aside, what we’ve done so far is just the beginning. Now that the platform is shipping in growing numbers, we’re able to give more and more attention to delivering fun games, improving customer experiences, and building up inventory so we can ship machines and games to customers and distributors on demand. We debuted our latest game, Cosmic Cart Racing, at the Texas Pinball Festival in March. Cosmic Cart Racing represents the 9th game developed for the P3 and the 3rd full game kit. It includes a new upper playfield module with never-seen-before features that include over 800 individually controlled RGB lighting elements and an auto-loading triple-magnet acceleration and lock feature on the right ramp. Cosmic Cart Racing combines traditional pinball gameplay features, such as a high-speed / flowing layout, modes, mini-objectives, multiball, multipliers, lane-change rewards, etc, with a cart racing game structure where you’re playing a race, or optionally a circuit of races, rather than a 3-ball or 5-ball game. Cosmic Cart Racing will also let you race against other players in real-time over a network, making it possible to compete directly against other players on other P3 machines, whether in the same location or across the internet. We introduced multi-machine gameplay in our Heads Up! mini-game, and we’re continuing to expand that functionality in Cosmic Cart Racing, which is expected to start shipping in August. •	We’ve been working with our manufacturing partner to optimize floor space and organize work cells for each subassembly, and our supply chain and inventory management as well as incoming/outgoing part inspection processes continue to improve. You won’t find these things advertised on a product website, but good manufacturing processes are essential to building and shipping increasing volumes of reliable products. •	We’re building up a database of customer support issues and feature requests so we can resolve customer issues quicker and continue improving game and system software. •	We’re working towards an update to our website to improve the software release and download processes. •	We’re working on updates to all games and system software packages. •	We’re also working on <secret stuff> to continue raising the bar and to bring increased value to the P3 platform. We’d like to offer another huge thanks to our pre-order customers for supporting and trusting in us. In under two months, we should be finished shipping pre-ordered games. Thanks also to those of you who recently put down deposits towards your new P3s. Your machines will ship immediately after the last pre-ordered machines go out. After that, we’ll ship to order. 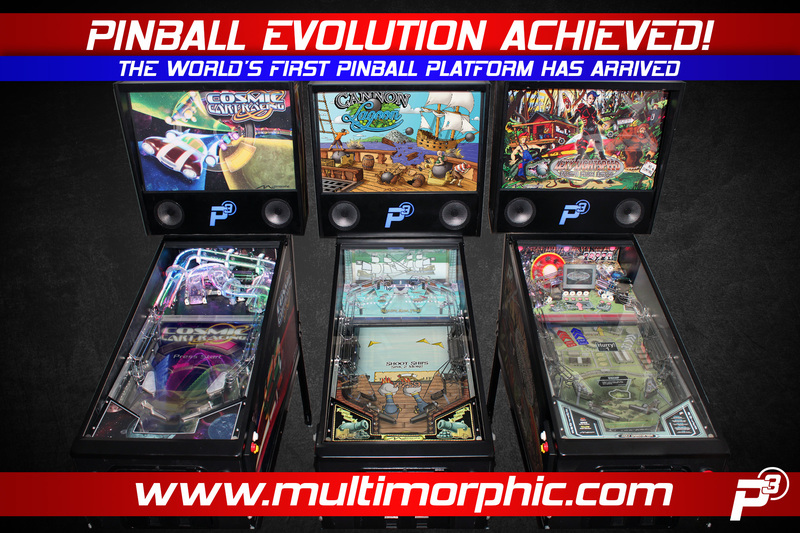 In addition to shipping P3s and P3 game kits, we’re also excited to have other pinball machine manufacturers join an ever-growing number of custom game developers by building their machines using our P3-ROC control system hardware and associated software frameworks. Thanks in part to amazing game releases, including Total Nuclear Annihilation by Scott Danesi and Spooky Pinball and Houdini by American Pinball, 2017 was a record year for us, and 2018 is looking even better. If you haven’t already, definitely check out both of those machines. We started this journey with big plans, and we continue reaching old goals and making new ones. As we look forward, we continue to need help in all aspects of our business. If you have a few hours a week to spare or want to discuss the potential of full-time employment, please contact me (gstellenberg@multimorphic.com). We most need business development and sales & marketing people, and we’re always looking to increase our development team, specifically with new illustrators, game content developers, and possibly more mechanical engineers. We’re also always looking for help raising more capital, specifically so we can subsidize future production runs and increase inventory faster. Also, if you live near southwest Austin or Dripping Springs, TX and want to be a part of the P3 manufacturing team, I can forward your information to our production partner. Thank you for you interest in and support of our journey. As always, please contact me with any feedback and questions.